Shanxi is bordered by Inner Mongolia to the north, Hebei to the east, Henan to the south, and Shaanxi to the west. It should not be confused with Shaanxi, which is pronounced in a way that is virtually indistinguishable to anyone unfamiliar with tonal languages. Shanxi spans an area of almost 157,000 km2,, making it 10,000 km2 bigger than Nepal. Shanxi’s capital is Taiyuan, a major industrial city located in the center of the province. The province’s name means “west of the mountain”, referring to its position to the west of the Taihang Mountains. Since ancient times, Shanxi has served as a buffer between China and the Mongolian and Central Asian steppes. The province has seen many rulers other than the Han, including the Mongolians and Manchurians who galloped in from the north. When the Ming Dynasty retook control of Shanxi from the Mongols after the fall of the Yuan Dynasty in 1368, they built up Shanxi’s Great Wall defenses, and Shanxi became an important route for military and trading expeditions. The security of the Great Wall led to a flourishing of trade, and Shanxi became famous for its merchants and bankers who gained control over much of the banking and salt trade in China and who created China’s first banks at Pingyao. Shanxi has a population of over 36 million people. 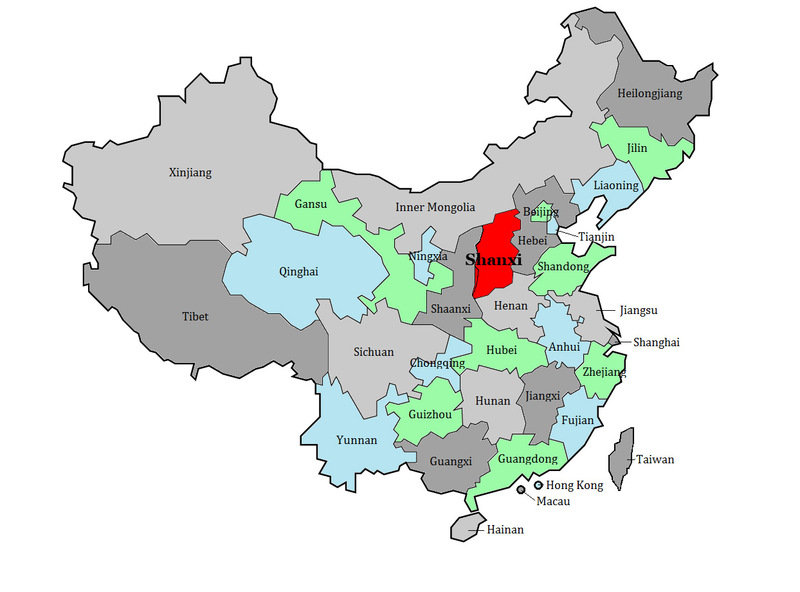 Taiyuan and Datong make up the two largest cities with populations of 3.2 million and 1.3 million people respectively. Shanxi is made up of over 99% Han Chinese and also has small minorities of Mongolds, Hui and Manchu people. 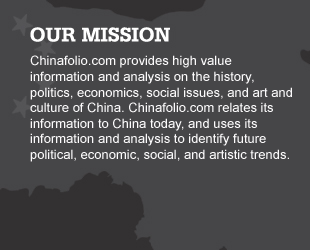 Shanxi’s annual GDP is over $207 billion dollars and its GDP per capita is around $5700. Because of soil erosion, only a third of Shanxi’s land farmed. Since the founding of the People’s Republic of China in 1949, efforts such as terracing, afforestation, irrigation canals, diking, soil desalinization, and land reclamation along rivers have helped to improve agricultural yields. Shanxi’s growing season in the north is just 120 days. Northern crops include millet, wheat, naked oats, potatoes and sesame. The southern growing season extends to 210 days and permits double and triple cropping. Winter wheat, millet, soybeans, gaoliang, corn, and cotton are raised as are smaller crops of tobacco, castor beans, rapeseed, sugar beets, peanuts as well as some fruits. Sheep are raised in Shanxi’s hilly terrain as are pigs, horses, yellow oxen, donkeys, and chickens. Shanxi also has a strong mining and industrial economy. The province mines anthracite, high-grade coking coal, iron ore, titanium, vanadium, aluminum, cobalt, copper, and edible salt. These resources have supported the development of heavy industry including steel, heavy machinery, aerospace, industrial chemicals, and chemical fertilizers industries. Iron and steel centers include Yangquan, Changzhi, Datong, and Linfen. Shanxi also produces cement, electronics, paper, textiles, household plastic products, milled flour and wine. It generates some thermal electricity and hydroelectric power. Its mining and related industry has heavily polluted some of its areas. 67% of Shanxi’s land is composed of the Loess Plateau with average elevations between 1000m and 1800m. The Loess Plateau extends almost 640,000 km² in the upper and middle reaches of China‘s Huang He or Yellow River. The name of the Loess Plateau comes from its silty sediment that has been deposited by wind storms on the plateau over the ages. Loess soil is highly erosion-prone, and is considered one earth’ most erodible soils. Shanxi’s plateau is framed by the Mount Wutai massif and the Heng Mountains to the north, the Taihang Mountains to the east, and the Luliang Mountains to the west. The Yellow River flows through gorges cutting across the province. 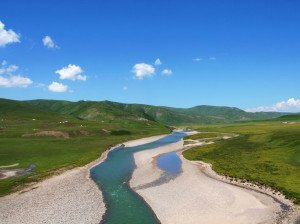 Shanxi’s other rivers include the Hutuo and its tributaries, the Fen, and the Sanggan. The Fen River valley is characterized by a chain of linked, loess-filled basins. The largest of these is the 160km long Taiyuan Basin which has significant coal reserves. Shanxi has hot, humid summers and long, dry, cool winters. 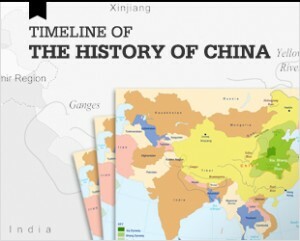 Shanxi was one of the birthplaces of Chinese civilization and culture, with people inhabiting the area dating as far as back as the Neolithic era beginning in roughly 10,000 BCE. Because of this, Shanxi has much to explore. The industrial city of Datong makes a good base for exploring northern Shanxi. 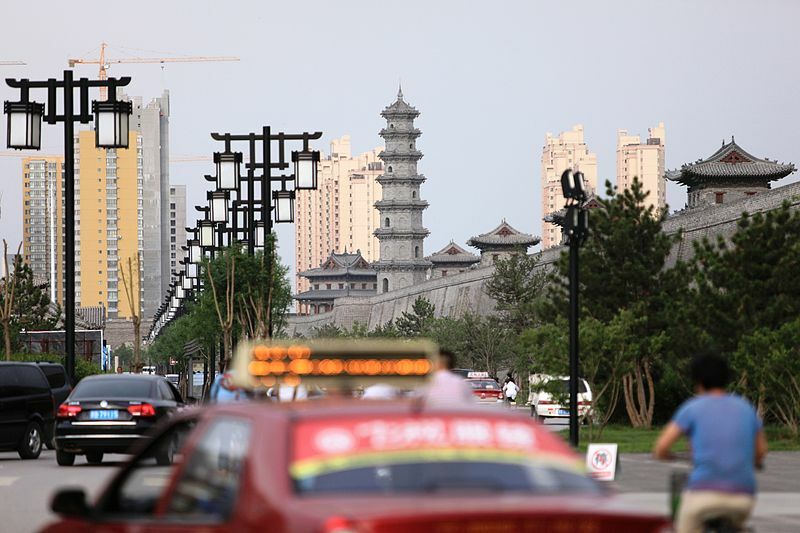 Much of Datong’s historical architecture was torn down during its industrialization; what is left of its old quarter is being renovated and parts of it are being rebuilt to replicate architecture of older eras. Datong has two temples of interest: the Huayan Temple and the Shanhua Temple. 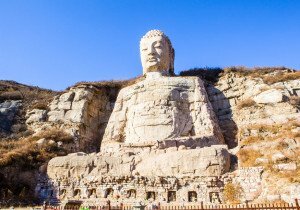 Datong is a good base for reaching the Yungang Grottoes, once of the best examples of Buddhist cave art in the world. Begun around the year 450, the 51,000 statues of important religious and political figures were carved over the next 60 years reflecting Greek, Persian and Indian influences that came via the Silk Road at that time. 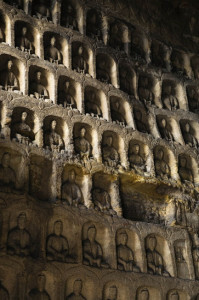 Stretching a full kilometer from east to west, the 53 caves in which the statues are housed were created by excavating a large area of the Wushu Mountain. 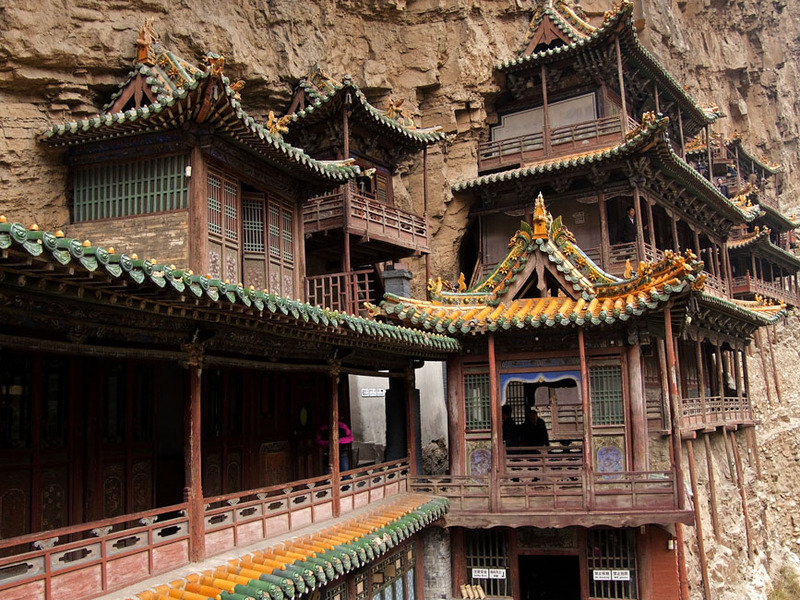 About 5km from the Yungang Grottoes is the impressive 1400 year old Hanging Monastery, built underneath an overhang at the foot of Mount Hengshan overlooking the 50m high west cliff of Jinxia Gorge. The inside of the monastery reflects a blend of Buddhist, Daoist, and Confucian influences prevalent in the culture of the time. Further south of the caves and the monastery is Wutai Shan, the Five Terrace Mountain, believed to be the earthly home of the Buddhist Manjusri, the Bodhisattva of Wisdom. Active monasteries sit nestled in the backdrop of its distinctive scenery. Close by is the town of Taihuai, also called Wutai Shan, home to many temples including Tayuan, Xiantong, Yuanzhao, Shuxiang and Santa. Taiyuan is home to Jinci Park in which a Buddhist temple complex sits in scenic surrounds, the Shanxi Museum, showcasing substantial collections of artifacts reflecting Shanxi’s and China’s cultural heritage, the Twin Pagoda and Chongshan and Confucian temples. Close by is Yuci City a preserved Ming town. Also of interest is the Tianlong Mountain or Square Mountain where the summer palace for the Emperor Gaoyang’s father was built during the Qin dynasty. Sui dynasty Emperors Gaoyang and Yangguan built an array of grottoes in the peak of the mountain which can still be visited as can its Chongshan Temple, meaning ‘Temple for Appreciating Kindliness’. It was originally built as a sojourning palace for the emperor of the time, was made into a monastery in 1381 AD after a massive extension, but was mostly destroyed by fire in 1864. Only the main gate, bell tower, main hall, and two side rooms remain today. Pingyao, China’s historic financial center, is China’s best preserved walled town, and almost 4000 Ming and Qing-era structures houses still exist within the city. The city walls date from 1370 and are overseen by 72 watch towers each inscribed with a paragraph from Sunzi’s Art of War. Pingyao has been the backdrop to many of China’s films. To the northwest of Pingyao is the Yellow River port town of Qikou, known for its ancient courtyards and cobbled roads and its nearby Ming-era Daoist Black Dragon Temple. Close to Qikou is Lijiashan, characterized by its hundreds of cave dwellings that at their peaked housed more than 600 families most surnamed Li. For almost 5000 years people have been dwelling in caves in Shanxi; scholars have estimated that at their peak, caves housed as much of a quarter of Shanxi’s population. Near Pingyao, the Buddhist Shuanglin Temple houses rare Song and Yuan painted statues; the castle-like Wang Family Courtyard has both cave dwellings nearby as well as a Yuan Dynasty Confucian Temple. Of equal interest is the Zhangbi Underground Castle built during the Sui Dynasty as protection from northern invaders. The small industrial town of Jincheng, located in the province’s southeast, is a good base from which to explore the historical villages, replete with traditional architecture, which dot Shanxi’s southeast. Also of note in the area are the 17th century Prime Minister Chen’s Castle, the Buddhist Haihui Temple and the Ming-era town of Guoyu.